FOR MORE GREAT SMARTPHONE DEALS, CLICK HERE. 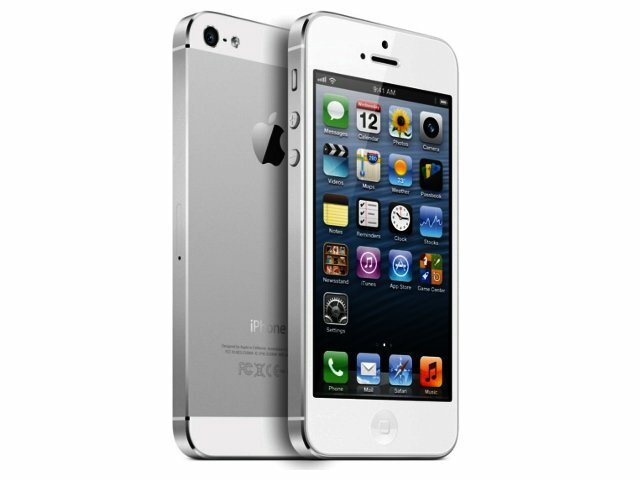 Apple’s iPhone 5 is more eye-catching than ever before, and thanks to solid under the hood improvements, the new iPhone 5 makes for a much better upgrade than the previous 4S (review). The latest iPhone feels like the scrum-half to the lock that is the Galaxy S3 (review) and the prop that is the Lumia 920 (review). In fact, number 5 is Cupertino’s lightest (112g; 20% lighter than iPhone 4S) and thinnest (7.6 mm) smartphone yet, resulting in the best device to use one-handed out of all the recent smartphones we’ve managed to test. Its premium dual tone (black and slate) anodized aluminum body looks amazing and feels solidly constructed, drawing in envying gazes from onlookers wherever we laid it down. Apple equipped the iPhone 5 with a new Retina display that measures 4" (640 x 1136 pixel resolution; 326 ppi) compared to 3.5" (640 x 960 resolution; same ppi) found on the 4S. Not only does it boast vivid colours (though not as good as on an AMOLED display) and fine details, but it outmatches most rivals (excluding the Lumia 920) when used outdoors in direct sunlight. Also onboard is a trustworthy-as-always 8 MP rear-facing autofocus camera which performs well in all lighting conditions, helping users snap excellent looking stills and lag-free full HD (1080p) videos. You are now also able to capture stills whilst recording video, and take panorama shots, but both of these features have been available to Android users for a while now. Thinner and lighter, but also taller thanks to the incorporation of a bigger 4" display. It’s difficult to fault the iPhone 5 on performance, since onboard is Apple’s new dual-core 1.2 GHz A6 chip with 1 GB RAM (not 2 GB as on the Samsung Note II, review). This makes things noticeably snappier when multitasking and accessing more advanced functionality such as taking HDR photos for instance. Less impressive than the new CPU, is Apple’s new iOS 6, which may sport more than 200 new features including Facebook integration, but looks and feels exactly the same as iOS 5. This consistency might be welcomed by new smartphone users looking for an easy to use interface, but power users who love to customise every aspect of their device will be better served by any of the latest crop of high-end Android-operating smartphones. iOS 6 is also looking seriously dated next to Android Jelly Bean, the latest version of the mobile platform. 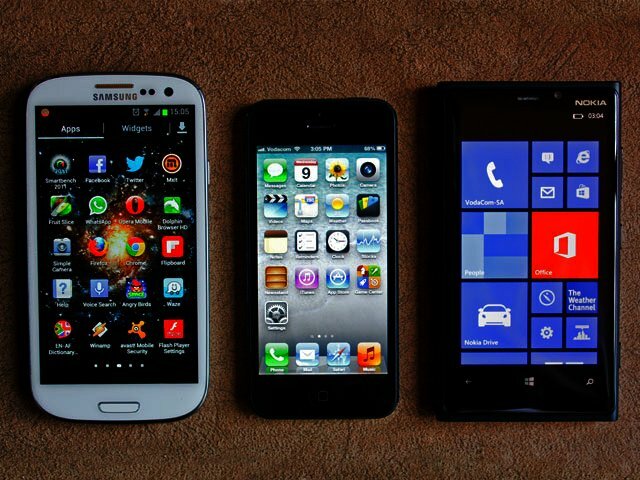 The iPhone 5 is dwarved by most of its rivals including Nokia's Lumia 920 (right) and the Galaxy S3 (left). The arrival of Google Maps to the App Store has played a huge part in mitigating the Apple’s beleaguered new Maps. Cupertino’s Maps app may sport turn-by-turn voice-guided navigation, but its cartography isn’t nearly as comprehensive as that found in either Google’s or Nokia’s offerings. Beyond the new OS, Apple also finally launched the full music section of the iTunes Store locally, making a huge library of more than 20 million songs available to local users. Single tracks go for around R7, with full albums coming in at R70. Additionally, you are also able to rent movies on iTunes for between R30 and R40 or buy these at approximately R130 - R150. All of your multimedia content and apps can be stored on the iPhone’s 16 GB worth of internal storage, although only 13.5 GB is user-accessible and this cannot be expanded upon due to the lack of a microSD memory card slot. For a more personal music listening or movie watching experience, Cupertino includes its new Earpod earphones in the retail box. According to the company, these have been redesigned to provide a more natural fit and now boasts a acoustic quality that is typically only found on higher-end headsets. We found that these do fit more comfortable than almost any other in-ear earphones, while they also sit more securely when jogging for instance. However, they aren’t noticeably better in terms of quality or sound power than your average headset. The iPhone's appeal has been boosted with the local availability of the iTunes Store. Apple equipped the iPhone 5 with a 1440 mAh battery, which lasted well past a 12 hour working day, as we managed around 14-16 hours from a single charge on average. Although the iPhone 5 does offer LTE connectivity, this service is currently not supported by the local service providers, but a software update is expected early this year from Apple to address this. It is worth noting that you now use a smaller Lightning connector the phone, meaning that users who have any iPhone accessories will have to fork out around R330 for a Lightning-to-30-pin adapter to use it on legacy equipment. 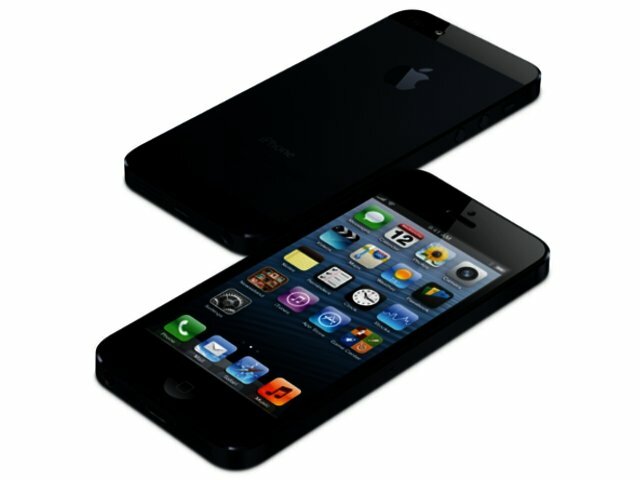 You also won’t be able to use your iPhone 4S’ micro-SIM in the new device, since it makes use of a new nano-SIM card format. 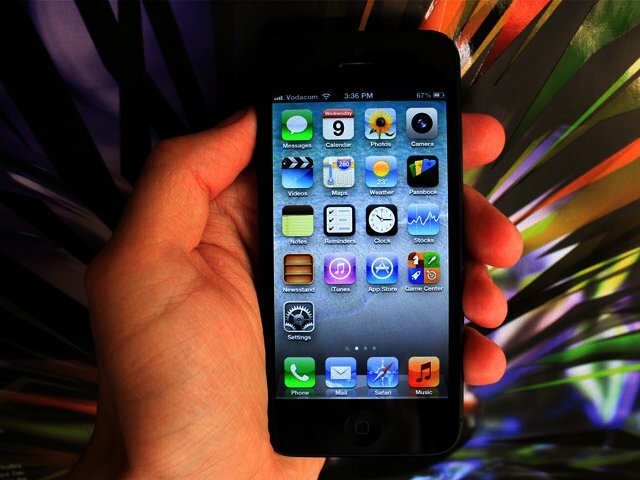 The iPhone 5 fits neatly in the hand and is comfortable to hold and use one-handed. As can be expected, Apple’s iPhone 5 is the best ever incarnation of Cupertino’s smartphone, especially in light of the local availability of the iTunes Store. It boasts a much needed larger display and quicker processor, within a more slender, featherweight frame that remains a classic piece of industrial design. Although staunch iPhone supporters will not be disappointed with their choice of smartphone, we feel that the Samsung S3 offers better spec bang for a lot less bucks. The iPhone 5 is available from Vodacom for a RRP of R8 800 for the 16 GB version we tested, R10 300 for the 32 GB model, and R 11 700 for the range topping 64 GB version. This means users are paying a premium over its closest rival, Samsung’s Galaxy S3, which costs R7 740 for the 32 GB version and R7 000 for the 16 GB model. Thanks to Vodacom for providing us with a review unit. Purchase music tracks and buy or rent movies on iTunes with SA account. New Earpod earphones fit comfortably in your ears. iOS appears long in the tooth in terms of its design. LTE supported by the device, but not yet by local networks. Can’t expand upon internal storage. Eye-catching design; purchase music tracks and buy or rent movies on iTunes with SA account; brilliant display; thin and light; easy to use one-handed; and new Earpod earphones fit comfortably in your ears. Premium pricetag; iOS appears long in the tooth in terms of its design; LTE supported by the device, but not yet by local networks; and can't expand upon internal storage.